In a Special Report in Grafik 179 we turned the spotlight away from the lone wolves and double acts of the design world and focused instead on the (often unsung) heroes of the design teams which operate inhouse. 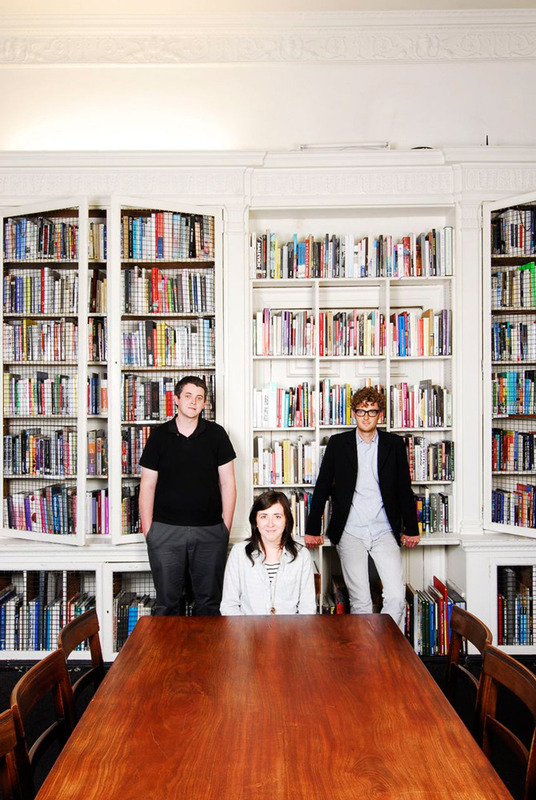 Here Zak Kyes introduces the Architectural Association's talented Print Studio team. The Print Studio at the Architectural Association (AA) consists of a small but talented team of two full-time graphic designers, Wayne Daly and Claire McManus, who help shape the substantial output of publications and printed matter. I (Zak Kyes) joined the Architectural Association as art director in 2007; my role is to direct the design of the institution, which often extends into other disciplines such as curatorial projects, teaching and, most recently, initiating Bedford Press, a private press founded in 2008 at the AA. In a typical week I am at the Print Studio every Tuesday, teaching one day per week, at my own studio, Z.A.K., the rest of the week and travelling on the weekends. The AA Print Studio operates within the Architectural Association, London’s oldest independent school of architecture, based in Bedford Square, and host to an ambitious programme of exhibitions, events and publications. The Print Studio was established in 1971/72 as part of the Communications Unit directed by Denis Crompton of Archigram in an attempt to organically shape the school’s architectural discourse through the production and distribution of publications. An early snapshot pictures members of the Communications Unit holding portable black-and- white televisions with their own images looped back upon the curved surface of the cathode-ray tube, as if to forecast the increasingly screen- based nature of graphic design. With a certain prescience, the immaterial, hypothetical nature of many architectural proposals from this period found their most logical expression not in built but in book form. The book became an ideal site for discourse and exchange. Over the past thirty years the Print Studio’s small team of editors and graphic designers has often worked independent of clear disciplinary boundaries and in close collaboration with architects, writers and artists. Recently we have refocused our activities as an autonomous unit within the broader cultural programme of the school. By considering these projects as operational models, this legacy is something I am interested in reconnecting to, but without the nostalgia of the past. What is your proudest design achievement? Disseminating the work of the Print Studio beyond the academic and intellectual context of the AA has been an important development. This more open approach, which seeks to develop collaborations beyond the AA, is one of the imperatives of Bedford Press. The press aims to establish a more responsive model of small-scale publishing, nimble enough to encompass the entire chain of production in one fluid activity, from the initial commission to the final printing. Bedford Press includes a print workshop equipped with a PostScript-compatible stencil printer on which some of the editions are printed. And the most memorable experience? An interest in the parallels between architectural and graphic space led me to curate the exhibition Forms of Inquiry: The Architecture of Critical Graphic Design, which investigates the exchange between the two disciplines. The exhibition originated at the AA in 2007 and travelled to Casco, Lux and Iaspis, concluding this year in a two-part exhibition at Bolte Lang and Archizoom. In each new constellation it expands to emphasise local research and sites for production. How would you describe the design ethos of AA? Today you can hardly open a design publication, visit a website or attend a lecture without being confronted with a designer’s ethos, of which the majority are nothing more than badly written platitudes about being ‘content-driven’, ‘functional’, ‘conceptual’ or ‘experimental’. We have never authored such a statement. Our only ethos could be to not have one, as I have never believed in designers who impose a signature or use formulas to produce work. I believe in rigorously changing the ways and formats we work in, both materially and conceptually, otherwise the work becomes predictable. Some might say this is precisely my style, or my ethos, but I see it as exactly the opposite. Why is an in-house team more successful for AA than outsourcing design? The AA connects two distinct aspects of work, design and everything else: teaching, planning and editorial work. The result is a practice that is in constant negotiation with the highly specialised role of the graphic designer. This negotiation is intrinsic to my practice, and also the way I view the Print Studio, which on one hand is a traditional design studio, and on the other hand routinely works in ways which amount to a practice that is more than just design. The debate, exchange, collaboration and ongoing conversations that underpin this process are impossible to outsource. Our working agenda includes a list of fourteen scheduled publications in addition to the termly, monthly, weekly and daily output of the Print Studio. We are a book machine. This feature first appeared in Grafik 179, October 2009.